John Hollenbeck was really hoping he could just record What Is The Beautiful? quietly and with a minimum of notice. In addition to diligent precautions taken to avoid being followed to and from the studio, John made all bandmates and recording personnel take a salty blood oath they’d never again speak of the album or dare let slip the finished product to anyone outside of Silver Spring, MD. Unfortunately, as we all know, the album was nefariously leaked and subsequently written about, extensively. Among the many secret-breaking journos who weighed in were The New York Times, Los Angeles Times,Washington City Paper, New York City Jazz Record, AllAboutJazz.com, BBC.co.uk, Audiophile Audition,Rochester City Newspaper, Avant Music News, The Gig and Jazz After Hours. Further shattering the wall of secrecy were those who audaciously named WITB? to their year-end lists, including JazzTImes, New York TImes, All About Jazz.com, Rock Erie.com, The Big City Blog, Step Tempest, Capital New York…and even more too nefarious to list. How word really got out, we’ll never know, but rest assured John will be recording What Is the Beautiful 2: What’s Really Beautiful underground, or possibly under the sea. Today will be the last day of University of Rochester’s outstanding Kenneth Patchen exhibition, U of R’s on-the-ground analog to the Patchen-inspired album they commissioned. Upstate locals, consider gathering friends & family for a field trip. Also tonight: John joins chief vocalizer Theo Bleckmann to perform at Lincoln Center Atrium; New Yorkers ought likewise gather compats in arms and overtake the Center (it’s free!). Then on Friday at 8:15pm John joins Pete Robbins, Simon Jermyn, Oscar Noriega and Ches Smith for the Winter Jazz Festival. Visit their website for tickets and further details. 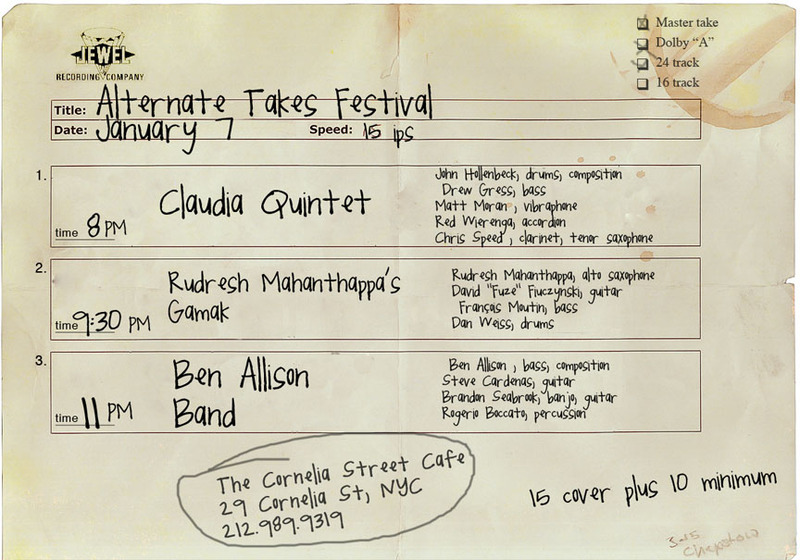 Topping off the week, Claudia Quintet returns to the Cornelia Street Café in the West Village for one and one set only this Saturday at 8pm. They’ll appear in original 5-man formation to mark their 15th year together as genre-deflectors extraordinaires, and hope sincerely you’ll join them. Hit that link or telephone 212/989-9815 to make the recommended reservations. All of us know well the feeling of receiving the gift that is as flexible as it is thoughtful: the gift card. Like nothing else, the gift card says “I’ve figured out what general type of consumer good you’d enjoy, but have not burdened you unduly with the specifics. Instead of choosing a gift I can’t be totally certain you’ll love, I’ll just provide this narrowly allocated strip of electromoney and let you decide yourself.” It is with these gift-givers in mind that we here at Team Hollenbeck have come forth to complete the thought process: If you’ve already been gifted a gift card, why not spend your plastic dollars on John & Co. this winter? Complete the gift your favorite givers were just going to give you anyways: Claudia Quintet, JHLE, ONJ—From which John’s “Falling Men” was just nominated for a Grammy—all our projects and friends can be found on iTunes and Amazon. Lastly, we invite you to share in a Hollenbeck composition of a different kind. Last month John’s longtime mentor & friend Bob Brookmeyer passed away at the age of 81. Please read here John’s elegy for the veteran master, a loving and deeply personal portrait of a legendary man bound to be long missed.